Bhavna Amin (right) gives a token of thanks to Dina Sheth. What is leadership? Society ascribes leadership in politics, religion, communities, sports, etc. based on actions, achievement, and at times, popularity. Typically, we limit our view of "leaders" to people in position of power: CEOs, politicians, athletes, and perhaps community leaders. There are leaders who have a strong work ethic and who win and accomplish major tasks; but are they life’s leaders? Are their characters worth emulating? True leadership is rooted in a person’s character, in their actions, and in the examples they set. But are those the only leaders? Everyone has the potential to be a leader in his or her own right. What about people who give their best every day to care for their communities, schools, and homes? Are they not leaders as well? In fact, do we recognize ourselves as leaders? Should we? To recognize the unparalleled leaders we know and admire, to acknowledge the leaders amongst us, and to enrich the leaders within us, BAPS hosted a Women’s Conference themed “Lead from Within” at 10 centers across North America. On March 22, 2014 over 400 women gathered at the BAPS Shri Swaminarayan Mandir in Lilburn, Georgia to participate in this annual event, now observing its seventh year. 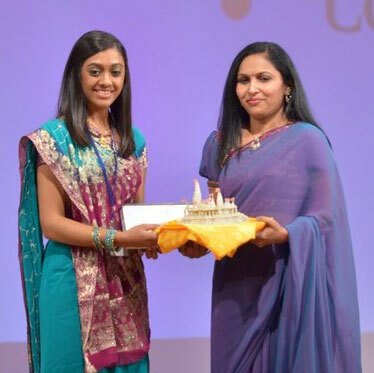 The annual conference is inspired by His Holiness Pramukh Swami Maharaj, the fifth spiritual successor of Bhagwan Swaminarayan, in an effort to highlight the empowering role of women in today’s society and also to ensure their spiritual growth as it will help them sail smoothly through life’s vagaries. Mrs. Dina Sheth, founder and director of the prestigious Kruti Dance Academy graced the event with her presence. She conveyed the message to “Lead from Within” through her personal outtakes and stories as a wife, a daughter, and most importantly, a mother. The audience took inspiration from her accounts and realized how they faced similar challenges in their lives. They understood that the choices they made everyday make them true leaders. In the opening dialogue Mrs. Toralben Patel, who is currently pursuing a Master’s degree at Embry Riddle Aeronautical University, led an energetic and interactive exchange to identify who they consider to be leaders and why. Her talk then asked of the audience, are we not leaders when we take charge of a task or project at work, in educating our children, when we care for aging parents, when we make everyday decisions impacting our careers, homes, and families? Truth is, everyone is a leader in their own way, as they take charge of their lives and are unwavering in their vision for themselves and their families. But what makes a good leader? How can we grow as leaders? Parul Patel gives a token of thanks to Nisha Mehta. The conference proceeded to discuss leadership essentials that would make a good leader. Mrs. Nishaben Mehta, who is currently an elementary school teacher at Loving Elementary, emphasized the need to understand one’s self, one’s belief system, one’s values, and one’s spirituality. Her talk focused on the need for a connection with one’s conscience as it plays an important role in day-to-day actions. When we have a firm understanding of who we are, the values we hold in esteem, the beliefs that guide our choices, we have a solid spiritual foundation. One that is essential in leadership as it speaks to our qualities, to our character. The conference aimed at portraying real life accounts of people who have not only cultivated but also strengthened their leadership qualities with spirituality. In delivering the closing talk of the conference, Mrs. Rimishaben Patel, a Health and Wellness Market Director for Walmart, shared fundamental qualities exemplified by leaders she looks to emulate. She expressed her admiration for Mahatma Gandhi, his perseverance, and the personal sacrifice he made in the cause for independence. She spoke of her ultimate role model, her guru Pramukh Swami Maharaj, conveying touching examples from his life exemplifying sacrifice, humility, stillness, and courage. In closing, she emphasized how his examples provide courage and stability in life’s challenging situations, guide her in everyday interactions and choices; and how that enables her to be an effective, poised leader in all her roles. After the conference, attendees also enjoyed the opportunity to network and share their perspective on the talks of the day. The younger members of the audience took notice of their own belief system and gained confidence in their ability to lead in their pursuits. Others recognized their strengths, contributions, and recognized themselves as leaders, some for the very first time.